Join the #HowDoYouJohnsonville Twitter Party on April 2nd! What are your plans for the evening of April 2nd? You may be intending to settle in to watch the season finale of Chopped Canada at 9pm ET, but I’m talking about the hour beforehand. 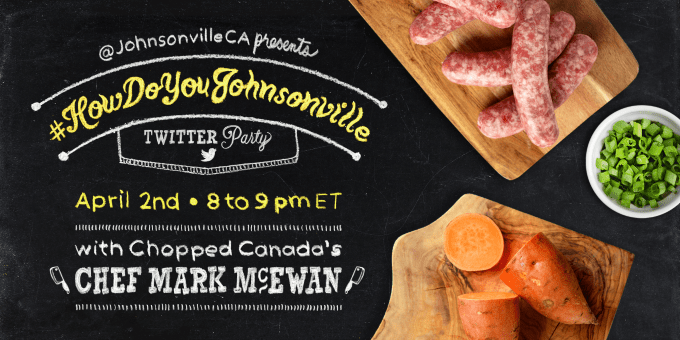 I’m inviting you to spend the hour with me, Johnsonville Canada and Chopped Canada’s Chef Mark McEwan at the #HowDoYouJohnsonville Twitter Party! Let’s gear up for the season finale by chatting about delicious food and the chance to win some fun prizes. I can almost guarantee you’ll be hungry by the end of the hour. We’ll be discussing our favourite regional food and local ingredients. I can’t wait to hear about the delicious Canadian cuisine everyone is cooking. I’m always open to trying new flavours and recipes! Follow the Twitter accounts above and add your Twitter name and link to the linky below to let us know you plan to attend! NOTE: The “your name” field should be your Twitter handle (i.e. @simplystacienet), and the “your URL” field should be your Twitter URL (i.e. http://twitter.com/simplystacienet/”).